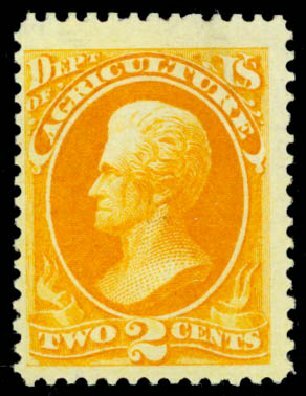 USA (Scott O2) 1873 AGRICULTURE 2¢ YELLOW (JUMBO) Huge stamp, fresh color, original gum, previously hinged, very fine jumbo. 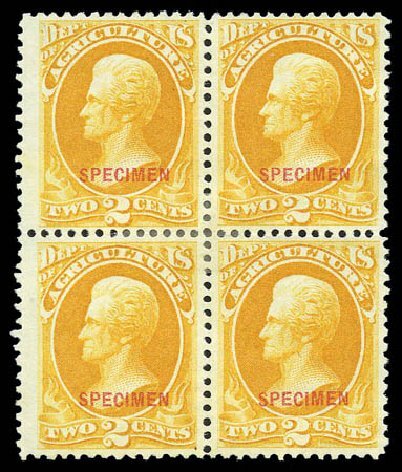 (2005 PF Cert #428254) Cat price $240. 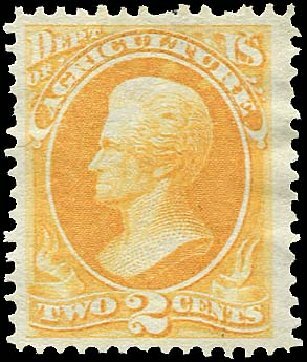 Agriculture Dept., 1873, 2¢ yellow (Scott O2), o.g., hinged, lovely example with warm rich color and large margins, Very Fine. 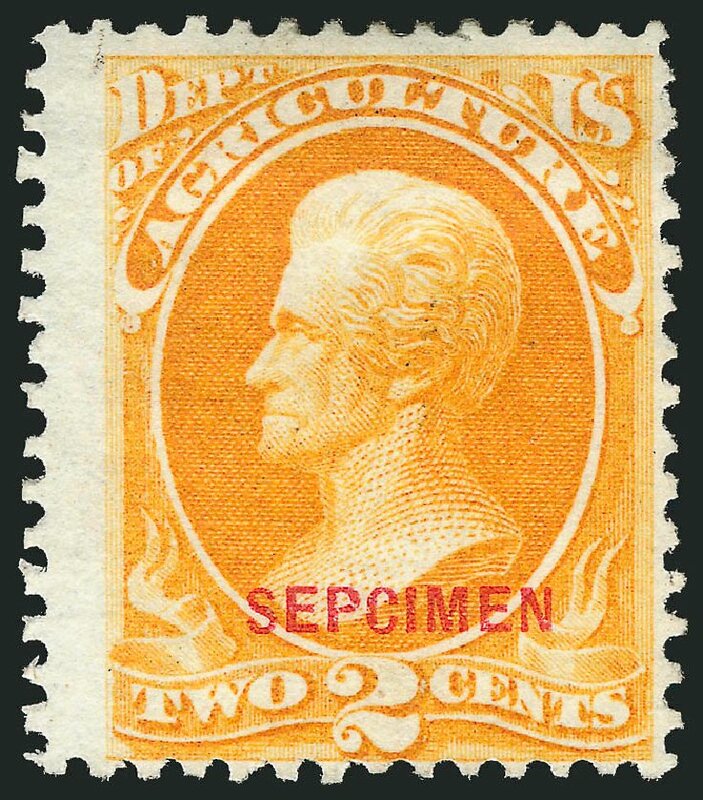 Scott $240. Estimate price $150 – 200. 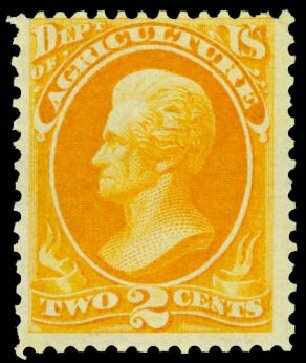 Agriculture Dept., 1873, 2¢ yellow (Scott O2), o.g., lightly hinged, impressive example featuring huge margins and glowing rich color, a pretty stamp, Fine to Very Fine. 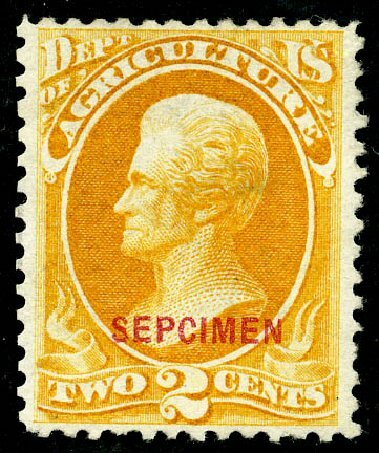 Scott $240. Estimate value $150 – 200. 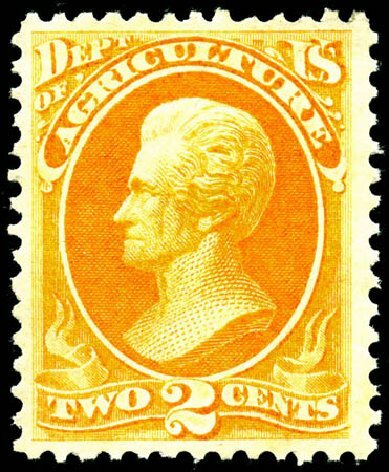 Agriculture Dept., 1873, 2¢ yellow (O2), o.g., never hinged, desirable example in a quality rarely encountered – a choice mint stamp with full unblemished gum, just like it came from the Post Office 140 years ago, Fine. 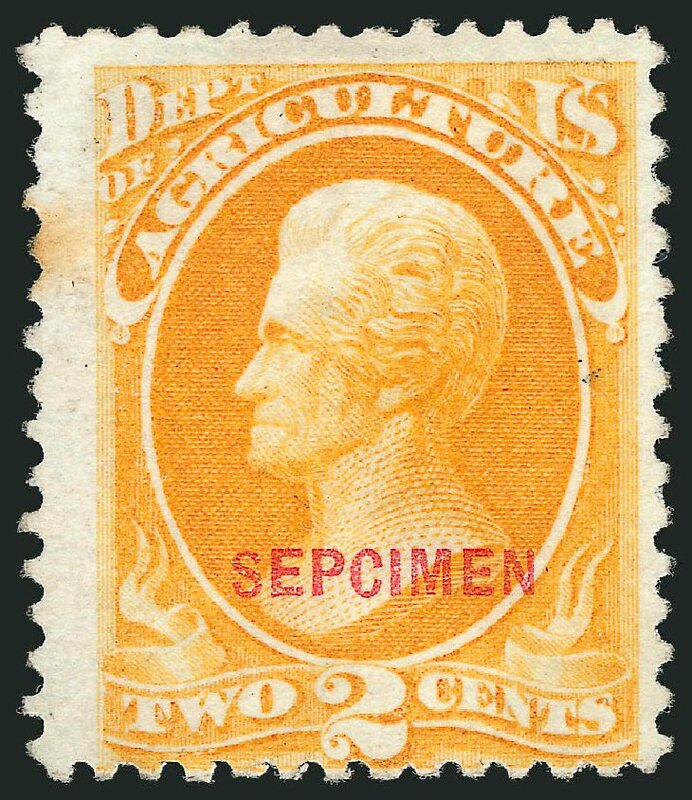 Scott $500. Estimate $200 – 300. 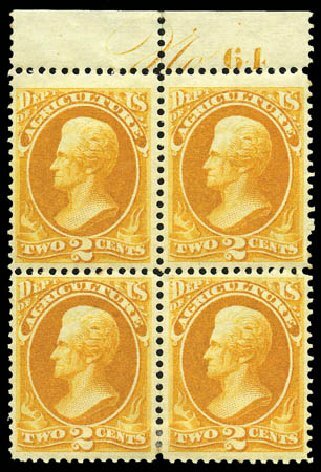 U.S.; Official, Agriculture Dept., 1873, 2¢ Yellow, Block of 4, #O2. L.h. to o.g. (h.r. ), well centered, Very Fine and attractive, PSAG (2011) cert. 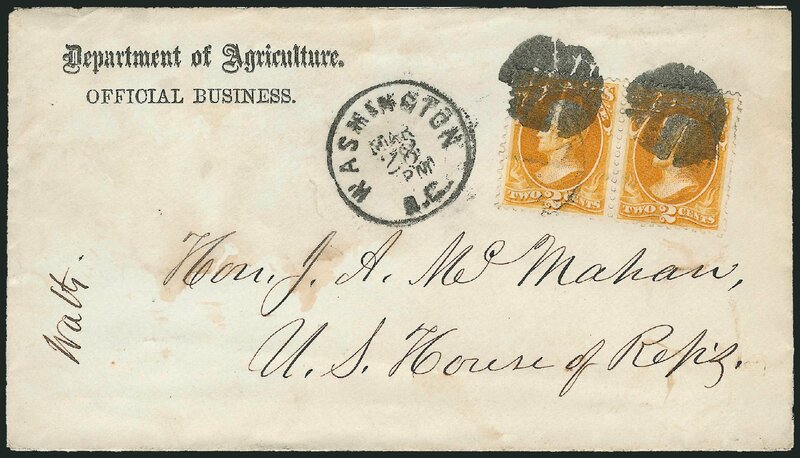 Scott $1,050. Estimate price $300-350. 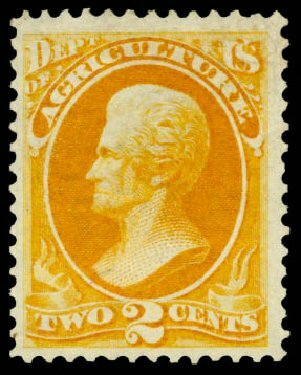 Agriculture Dept., 1873, 2¢ yellow (O2), top margin block of of four with plate no. 64, well centered with rich color, original gum, hinge remnant at bottom, Very Fine. 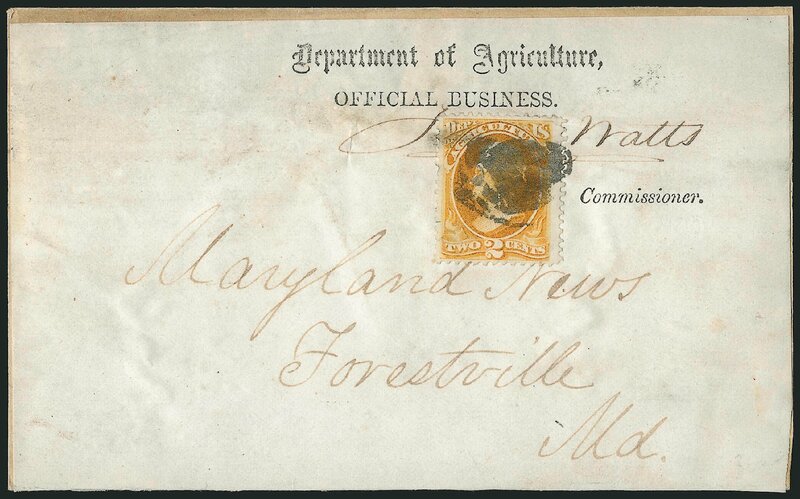 Scott value $1,050+ Provenance: Lockyear. 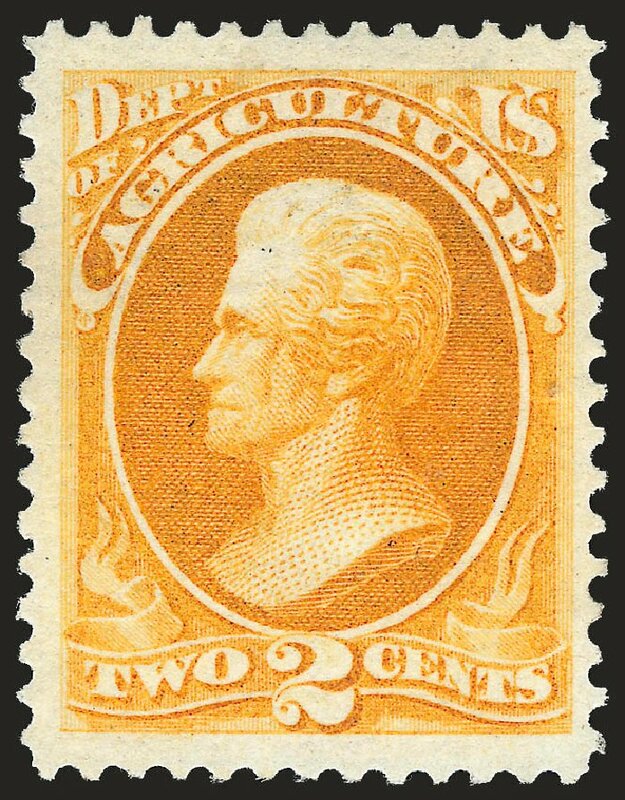 Agriculture Dept., 1873, 2¢ yellow (O2), well centered with wide margins and deep, strong color. Original gum. Very Fine and choice. 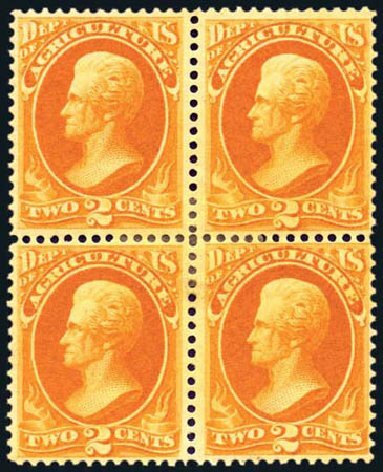 Scott $230 Expertization: 2005 P.F. Certificate.